Stand for Children is a collaboration between CASA /Youth Advocates, PathWaysPA and Family Support Line. If you would like to attend the event, please email Tonya Diggs or call her at 610-543-5022 x219. Raise awareness of the problem of child abuse in our communities. Provide tools that intervene and prevent the trauma. Recognition and Honoring for their commitment to children and families and prevention of child abuse. District Attorney John Whelan, Esq. Our children deserve to grow up in safe homes and communities. Child abuse hurts our future. Our communities are stronger when children are safe and secure. If you would like to attend the event, please email Tonya Diggs or call her at 610-543-5022 x219. From our friends at the Coalition on Human Needs. Every five years, Congress reauthorizes the Farm Bill, a comprehensive piece of legislation that includes, among other items, SNAP/Food Stamps. This year, the Farm Bill is up for reauthorization. CHN is circulating a sign on letter for Pennsylvania organizations that urges Senators to strengthen and protect SNAP, and to oppose any proposals to cap or reduce funding, restrict eligibility or reduce benefits in SNAP. Sign your organization onto this critical letter urging Senators to strengthen and protect SNAP. Please distribute the letter and encourage other groups in your network to sign. Click here to view and sign the letter. As Congress considers Fiscal Year 2013 funding action, it is imperative that advocates across the nation show their support for the Women, Infants and Children Program (WIC). The National WIC Association's (NWA) national bipartisan poll found that Americans overwhelmingly support WIC and oppose funding cuts to WIC by a two to one margin. Still, the WIC Program is in jeopardy of suffering significant funding cuts if we fail to act. NWA is asking national, state, and local organizations to sign on to this coalition letter protecting WIC by March 28, 2012 by emailing Samantha Lee at slee@nwica.org. Please share this message with your partner organizations and invite them to sign the letter. The U.S. Small Business Administration and U.S. Department of Labor invite you to participate in a special Women’s History Month conference call for women small business owners featuring Secretary of Labor Hilda L. Solis, SBA Deputy Administrator Marie C. Johns, and other officials from the SBA and DOL who will provide an update on their agencies work for America’s women and small business owners. Candidate must possess knowledge and understanding of volunteer recruitment and retention. Will have experience with issues related to older adolescents. Possess the ability to identify with and adapt to the goals and philosophies of the mentoring program. Be a mature individual with knowledge of parenting issues, community resources, and the skills necessary to live independently. This person shall demonstrate insight, empathy, flexibility, perseverance, and team orientation. Generate reports and supervise 1 full-time and 1 part-time employee. Must be able to make presentations to businesses, corporations and other service groups to provide information and elicit interest. A BSW or Bachelor's Degree is required for this position. Please fax your resume to: LD/BD at 610-328-2807. Every five years, Congress reauthorizes the Farm Bill, a comprehensive piece of legislation that includes, among other items, SNAP (also known as Food Stamps). This year, the Farm Bill is up for reauthorization. As Farm Bill deliberations begin, the Food Research Action Center is asking organizations that support SNAP to show that support. FRAC is circulating a sign on letter for organizations that urges Senators to strengthen and protect SNAP, and to oppose any proposals to cap or reduce funding, restrict eligibility or reduce benefits in SNAP. 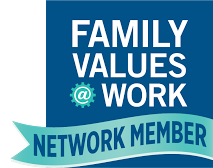 Sign your organization onto this critical letter urging the Senate to strengthen and protect SNAP.Please distribute the letter and encourage other groups in your network to sign. In June 2008, Anne Marie faced a difficult decision. Her sister, Joanne, had been diagnosed with late stage, terminal cervical cancer that left her in need of round-the-clock care. Joanne was unmarried and without children, and her remaining parent was elderly and suffering from her own medical problems. Since Joanne needed IV fluids and a feeding tube, hospice was not an option. Rather than see her sister suffer alone, Anne Marie took the time to care for her sister until the end of her life - and lost her job in the process. Even though Anne Marie applied for Family and Medical Leave Act coverage at her job, her application was denied because she was using it to care for a sister. Had Joanne been her mother, spouse, or child, the leave would have been granted. But even though Joanne was a member of Anne Marie's immediate family, FMLA was not an option. From our friends at the Amputee Coalition. This month, the Amputee Coalition submitted a request to the President of the United States to designate April as Limb Loss Awareness Month. This designation would give individuals in the limb loss community a time to rally together, support one another, educate the broader community about limb loss prevention and raise awareness of issues that members of the limb loss community face. We are asking that if you have not taken action yet - that you do so TODAY and ask your family, friends and co-workers to join you in sending a strong message to the White House on behalf of designating April as Limb Loss Awareness Month. Please contact the White House and tell them that you want the President to sign the Limb Loss Awareness Month proclamation! We only have a short time before they make a decision, and we need you to ask for support now! From our friends at CHN and the Children's Defense Fund. On Wednesday, March 21st at 12:30 p.m. EDT, let’s stand with our children and young adults and celebrate the second anniversary of the Affordable Care Act (ACA) that will provide access to health coverage for more than 95 percent of America’s children and strengthen America's health care system for everyone. Let’s create a national trend on Twitter as we share real stories of real children and young adults. Join us and let’s all be grateful that there are now fewer uninsured children in America than any time on record—thanks to the ACA!! Follow CDF on Twitter @ChildDefender and host your own Tweetup or join in the Twitter party at 1 p.m. from your desk or on-the-go through your mobile phone. Let’s stand together with our children and promise them we will never roll back the ACA health benefits children need to survive and thrive. Without the help of the state’s General Assistance cash program, Julie Schnepp said she would still be homeless today. Republican Gov. Tom Corbett’s $27.1 billion budget proposal calls for the elimination of the General Assistance cash program. Michael Froehlich, a staff attorney at Community Legal Services of Philadelphia, said the elimination of the GA program and an anticipated slash in the GA-related medical assistance will result in about $319 million in cuts. Cuts to the GA program will affect about 68,000 people across the state. About 1,762 Delaware County residents are GA recipients, according to figures from the Pennsylvania Department of Public Welfare. Help urge the Appropriations Committee to include the State Paid Leave Fund in the Fiscal Year 2013 Labor, Health and Human Services & Education bill. The Fund is included in the President’s budget at $5 million and would provide competitive grants to states considering paid leave programs. The goal of these initiatives is to help families maintain their financial security when illness strikes or family caregiving needs arise. Federal support is critical to fuel innovation in leave policy. Through the State Paid Leave Fund, states could develop and plan for the implementation of paid family and medical leave programs. Grant funds would be used for activities such as program design, research and analysis, stakeholder consultation, actuarial analyses, and development of a financing models and benefit structures. The big news out of Harrisburg last week was that Governor Tom Corbett signed the voter ID bill, which, according to an article in the Pittsburgh Tribune Review, will require voters to show photo identification before they can cast a vote in the November general election. By a 104-88 vote the House approved the bill that supporters say will reduce the potential for voter fraud but opponents say will prevent some senior citizens and low-income people without ID from voting. “I am signing this bill because it protects a sacred principle, one shared by every citizen of the nation. That principle is: One person, one vote,” Corbett said. As for threats of lawsuits from opponents, Corbett said, “The law is passed. If someone challenges it, we will defend it.” Click here to read the Pittsburgh Tribune Review article. Click here to read previous posts about the bill. To mark the 2nd Anniversary of the Affordable Care Act the Pennsylvania Health Access Network (PHAN) has organized house parties throughout the state. Hundreds of Pennsylvanians will be attending these house parties over the next two weeks. Join them! Defend the Affordable Care Act, learn about what's happening in the Supreme Court and get the latest updates from Harrisburg and DC. Below is a list of some of the House Calls being held in the Philadelphia area. If you would like to look at the full list or need more information please visit http://pahealthaccess.org/HouseCalls. All are welcome to attend an informational roundtable discussion. Hope to see you there. RSVP/More info here. 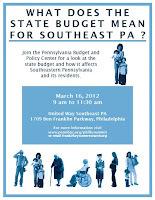 Recently, the Pennsylvania Budget and Policy Center hosted their annual Budget Summit. This Summit provided an in depth look at the state and federal budget plans and how they are impacting communities through out the state. Numerous presentations were made at the Summit and PBPC has shared all of the information online. If you would like to access the materials used at the summit and view some of the presentations just visit: http://pennbpc.org/2012-pennsylvania-budget-summit. Last week Mayor Nutter gave his budget address, which put spending this year slightly above last year’s ($3.6 billion compared to $3.5 billion). No major cuts are expected but that may change based on the state budget. The Mayor’s current plan does not include any major tax increases for Philadelphia, however, he did announce plans for a new property assessment system that will bring in an extra $90 million in revenue. 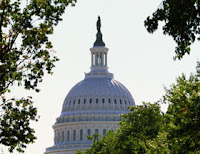 Congress is currently deliberating over Fiscal Year 2013 appropriations – including Community VITA Matching Grant funding. One of our champions, Representative Xavier Becerra, has drafted a letter asking the Appropriations Committee to include $15 million to expand and strengthen the Community VITA program. Please call your U.S. Representative to ask them to sign on to this letter! We're working under strict time constraints: signatures must be collected no later than 12:00 p.m. (noon Eastern) on Friday, March 16. Please take a moment to call the U.S. Capitol switchboard at (202) 224-3121 and ask to be connected to your Representative. you can watch it online! From our friends at the Aspen Institute. "Given that there are livable wage jobs, given that there's tremendous revenue, and given that it is one of the largest industries... We cannot ignore or overlook the restaurant sector as one that we don't focus on for training or for workforce opportunities because there's tremendous potential there." The Pennsylvania House of Representatives may vote as soon as this week on legislation that would enact a costly voter identification law in the state. This program may move forward despite its pricetag of $11 million for a measure that will put up barriers to people who want to exercise their right to vote. Discuss this bill with your representative today. The state Senate approved the bill by a vote of 26 to 23 on Wednesday. It now heads back to the House for a concurrence vote since it was amended in the Senate. If passed by the House, it will go to Governor Corbett's desk for a final signature. Learn more in this Philadelphia Inquirer article. This could be the last chance to take action on this bill in the Legislature. Please email and call your House Representative today. Crossposted as part of the MomsRising Blog Carnival. In 2010, dear friends of mine gave birth to a baby girl. I saw the first pictures of her, not even an hour old, while I was writing a blog post about another important event, the first anniversary of the Lilly Ledbetter Act. She looked so serious in some of those pictures, as if she was determined to figure out this strange new world and her place in it. For years, I had been working on issues that affected women and girls, and thinking about them abstractly. That morning, for the first time, I considered how those issues would affect one child in particular, and I wondered what I could do to make sure she grew up in the best world possible. Women small business owners are at the backbone of our recovering economy, and starting a small business can be a smart professional decision for many women including our returning veterans. In order to make sure that women small business owners are successful, the BPW Foundation is asking you to contact your Senators ASAP about sponsoring a new bill, The Fairness in Women Contracting Act. The purpose of the bill is to address two outstanding barriers that have arisen since implementing the Women Owned Small Business (WOSB) procurement program in March, 2011. This bill improves the WOSB procurement program to lift the dollar caps on the awards in the qualifying 83 NAICS codes, and gives sole source authority to the program. Sole source contracts have a cap of $5 million—the same as in the other small business procurement programs. It also allows women owned small businesses to bid on more lucrative contracts within the WOSB program. On Wednesday March 7, 2012, the Senate of Pennsylvania passed the Voter Suppression Bill (House Bill 934) by a vote of 26 to 23. Find out how your PA Senator voter and email him/her to let them know how you feel about their vote (templates provided at this easy to use tool: http://bit.ly/HB934email).